I can see how to connect everything from the receiver to servos,that is kind of a no-brainer. But figuring out where the batteries hooks in to the system providing power for all of the controls is a bit unclear to me. I am also looking to find out where I can get a push button safety switch to prevent an accident after turning on the power. Most all small electronic speed controllers (ESC's) have what are called BEC's. Battery Eliminator Circuits. 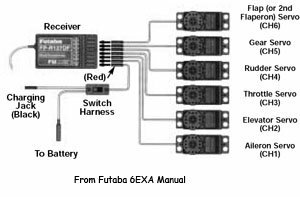 This allows the receiver to be powered with the same battery that powers the motor. BEC's also monitor the battery voltage and are most always programmed to cut the current to the motor when the battery voltage reaches a certain level. This is done to protect Lipo Packs because Lipo backs are easily ruined if you discharge them too far. Some receivers have external BEC's. Meaning that its separate from the electronic speed controller. External BEC's are attached to your battery on one end and are plugged in to the battery port on the receiver. Let's assume your electronic speed controller has an internal BEC, more than likely it does. Your ESC attaches to the battery with the thickest gauge wires. Fairly straight forward. Sometimes you have to solder on the correct plugs to the battery if they don't match. I have to do this with most of the batteries I buy. The lead that has the same end connector as a servo connects to the throttle channel of your receiver. This provides power to the receiver and also allows you to control the speed of the motor. If you have a brushless motor then you will have three leads coming off the ESC for the motor. Check rotation. If the motor rotates backwards then change any two wires to change the direction. If you have a brushed motor then there will only be two leads for the motor. And ESC made for a brushless motor will only work with a brushless motor, and vice/versa. If you have a Lipo battery there will two large gauge wires coming off of it, these attached to the ESC. This is where you may have to solder on new plugs if they don't match. If you have an RTF or bought a package that came with the battery then the connectors should match already. If you have a Lipo Pack, there will also be a smaller plug with several tiny wires. This is for charging your battery only. Do NOT plug this into the receiver. It will fry it! I hope this helps. If you are still unclear let me know. What type of plane do you have? what is the normal rotation? clockwise or counter clockwise. My motor glider seems to be wired this way but if I turn off the transmitter the motor starts after a couple of seconds and runs at full speed. An easy solution is not to turn off the transmitter until the main battery is disconnected but should this happen?